I’ve never touted myself as a gourmet. In fact, I’m pretty sure most people I know think that my signature dish consists of Macaroni and Cheese or Chinese delivery. But just to prove everyone wrong have a tasty meal once in a while, I’ve been trying my damnest to make some tasty new foods. Roughly four and a half years ago, Mr. Bee and I tied the knot. For greed whatever reason, we registered for gifts that almost five years later have hardly seen the light of day. A pasta maker, milkshake maker and deep fryer were brilliant ideas at the time, but seriously, who makes their own pasta?! Certainly not me. But when we moved in to our new home, Mr. Bee declared that he felt like we’d be much more likely to deep fry stuff in this home than our previous one. What does that even mean?! We finally broke that sucker in the other day and I’m totally hooked. Mr. Bee has smelling abilities of superhuman proportions hates the smell of the oil and thinks the whole house smells like deep fryer. Undeterred, I’m already planning my next adventure in to deep frying. 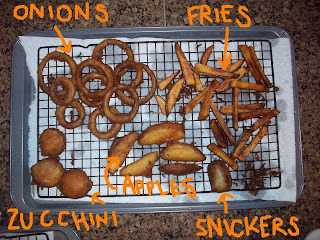 I think the best results were the onion rings and the apples with cinnamon sugar! But the zucchini with bleu cheese dressing was really good too. I will continue to search my house pantry for things to throw in the deep fryer. It was so good and pretty ridiculously easy. Now if my husband would work just a smidge closer to home, I could practice some of these recipes nightly. 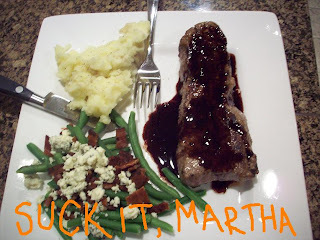 Because I don’t know about you, but I refuse to cook a full meal for 1.5 people. Sorry Bee, but it’s another Frankenstein dinner of chicken, random veggies, and cheese for you.